The Dunning-Kruger Effect is a cognitive bias in which unskilled people form wrong conclusions or make poor judgements because they rate their level of competence as being much higher than it is in reality. People’s own incompetence prevents them from recognising their own ineptitude. The phenomenon was first observed by the psychologists Dr. David Dunning and Dr. Justin Kruger (published in 1999). It links well to the saying “a little knowledge is dangerous” and also “ignorance is bliss”. For conversion rate optimisation it may partly explain why initial success is often followed by a large dip in performance. Craig Sullivan calls this period the “Trough of Disillusionment” as optimisers begin to appreciate that they are not as brilliant as they thought they were. One reason for the Trough of Disillusionment is that most optimisers begin with low hanging fruit, fixing the obvious deficiencies first. Once these are resolved it can becomes progressively more difficult to achieve significant uplifts without first obtaining insights from users or other sources of qualitative and quantitative data. Getting uplifts from the low hanging fruit may of course give optimisers false confidence in their ability as people like to take the credit for improvements even if they are obvious changes. 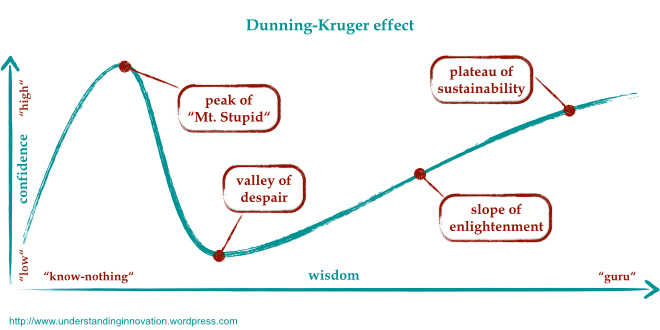 The Dunning-Kruger effect should remind us not to get too confident about our abilities. Optimisation is a complex and never-ending process that requires a structured approach to avoid random testing. The fact that the majority of experiments often fail to result in any significant uplift in the conversion rate demonstrates how difficult it is to predict how changes to a website will influence visitor behaviour. To avoid falling into the trap of the Dunning-Kruger effect encourage a culture of experimentation and evidence based optimisation. Focus on learning from experiments, whether they generate an uplift or not and avoid placing too much value on your own ideas (not invented here bias). Evaluate all tests equally so that you explore whether changes (positive or negative) are responsible for the difference in the success metric.